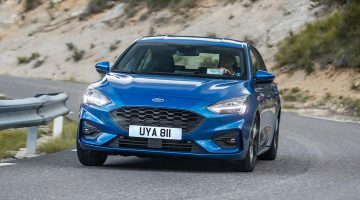 Ford has quite a history of building performance cars for the people in the region, with hot versions of Fiestas, Escorts and more proving to be a blue collar favourite for those who could and couldn’t afford them. Of course the same sentiment is also felt in the much larger United States, with the much larger Ford Mustang – and now it’s in the UK. The recipe hasn’t really changed much in its travels from the New World either, combining a massive two-door coupe or convertible bodyshell, V8 engines (EcoBoost four-cylinder variants are also available) and all the subtlety of a maid of honour at a Cardiff hen do, in a way only an American muscle car can. It’s a genuinely satisfying car, with a thundering soundtrack and a real sense of fun whether you’re on the daily commute or driving briskly. That Ford has chosen to finally offer it in right-hand drive is something in itself to celebrate. If you live across the pond, then you should seriously consider the Shelby GT350 and recently revealed GT500. Their 5.2-litre flat-plane crank V8 (the latter supercharged) and more focused chassis helps transform the Mustang into a much more serious road and track car. It requires commitment when driving fast, but is an incredibly engaging and truly unique driving experience. But for now, is the Mustang worth a punt against more traditional performance car alternatives? Sitting at the foot of the Mustang range is the $48,500 2.3-litre four-cylinder EcoBoost; next up the ladder is the 5-litre V8 GT, priced at $55,000. This duo comprise the entire Mustang model line-up in Europe, where the GT350 models aren’t offered, although there are limited editions from time-to-time. A manual gearbox is standard, although an automatic transmission is available for a hefty $4315 on both variants. Either can also be had in convertible form for a $4500 premium. Cylinder count, swept capacity and performance aside, the differences between the 2.3 and 5.0 aren’t major. As standard the EcoBoost car comes well equipped, benefiting from a limited-slip differential, LED headlights and Android Auto/Apple CarPlay compatibility. To rein in the V8’s extra grunt it gets more powerful Brembo brakes, and there are line-lock/launch control functions, too. The Bullitt is only available as a V8 paired to the manual transmission, and starts at $62,000, but features plenty of extra kit such as Recaro seats and bespoke styling elements, as well as slightly more power from the engine, uprated suspension and underbody bracing. Rivalry comes in the shape of the evergreen Nissan 370Z and spritely BMW M240i. The Japanese coupe offers the budget option, priced some $9000 less than the smaller-engined Mustang, but its charms are starting to wear thin in its advancing years. BMW’s junior coupe, the $48,169 M240i, may compete in a different size bracket, but it splits the two Mustangs in performance terms. It’s more polished than the Ford and better built too. That said, it’s not a full-fat M-car, so doesn’t carry the exclusivity factor like the American pony car. 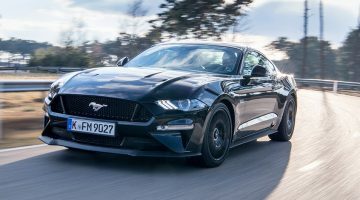 But the Mustang’s recent update has corresponded with a reasonably chunky price rise – meaning a near-$65k Mustang is now a reality, which is suddenly a large amount of money to pay for a Ford – regardless of what’s under the bonnet. It comes as little surprise to say right away that a V8 engine is imperative for the Mustang. The 2.3-litre turbocharged four-cylinder EcoBoost unit is not only at loggerheads with the very ideology of the Ford Mustang, but it’s also objectively rough, slow, laggy and wholly unsuited to it. Not that you’ll need to know, but the EcoBoost Mustang takes a glacial 5.8sec to reach 100kph when fitted to the manual transmission, with the automatic shaving 0.3sec off that time thanks to the short gearing. Don’t go thinking then that this might be a lower, rear-drive Focus RS, and trust us, stick to the V8. When you do, the naturally aspirated 5-litre ‘Coyote’ unit is everything you might reasonably expect of an American V8. Performance is impressive, since its mid-life update, picking up some extra power and torque. It’s high kerb weight does take the sting out of the mid-range, but work the boisterous engine and it absolutely feels its power figure, hitting 100kph in just 4.3sec when fitted with the automatic gearbox, and 4.6sec with the manual. Convertibles add 0.2 of a sec to the respective transmissions, thanks to a little extra weight. The Shelby GT350 reaches 100kph from a standstill in 4.3sec, and although it certainly hasn’t been designed to simply win drag races, it will certainly go fast in a straight line. The flat-plane crank V8 produces a fascinating noise; it’s gruff and rumbly low down, then from 2000 to 4000rpm there’s a Subaru-like burble before sounding like a sonorous V8 up to 6500rpm. During the final 2500rpm, up to its 8250rpm limit, you almost hear a VTEC timbre – a slight vibrato that’s unexpectedly harsh. Initially the natural point at which to change gear seems around 6000rpm, rather than waiting until the red line. When you do brave the final quarter of revs it’s almost intimidating. The 5.2 doesn’t possess the screaming, free-revving top end like one of Maranello’s flat-plane crank V8s, and so it’s better to revel in the natural-feeling band between 4000 and 6000rpm. The 5-litre ‘Coyote’ V8 that powers the current Mustang has been in use by Ford since 2011, replacing the ancient artifact that was the 4.6-litre ‘Windsor’ that went before. On its first application in the current-gen Mustang, it produced a reasonable 410bhp. After its mid-life update last year, that figure has jumped to a 992 Porsche 911 Carrera S-matching 444bhp, giving the latest Mustang plenty of bite to match its considerable V8 bark. As mentioned before, the 2.3-litre turbocharged four-cylinder EcoBoost is the entry point in the range, with a far more pedestrian 286bhp. Not only is this figure comparatively low, it’s also produced sky-high in the rev range at 5600rpm, giving you a fair idea as to the amount of turbo lag that must be fought against in reaching that number. Transmission choices are between a six-speed manual ’box, and a new ten-speed automatic. The manual has a satisfyingly hefty shift, in keeping with its rough-and-ready image. Shifts aren’t always clean though, and rush through shifts and it can feel a little cumbersome and clunky. The Bullitt’s white shiftknob is especially lovely though, replicating the pool ball topper from the original 1968 film car. But we now come to the automatic transmission. Launched alongside the mid-life update last year, the all-new ten-speed torque converter automatic was co-developed with General Motors in a rare show of bipartisanship between the two arch rival companies. Spread throughout both model ranges in everything from giant F-150 pickups to the mad 600bhp Camaro ZL1, you might say that this is a troubled transmission. To start with there is the sheer amount of ratios to choose between. Ten gears is just too many, the car shifting so frequently that the engine barely has time to breathe. 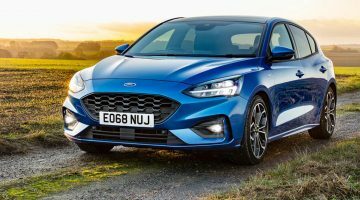 A similar murmur could be said against other ten-speed boxes, but the Ford’s slow, slurring shifts and overactive torque converter makes it feel like the car is rarely ever fully engaged in a gear. Take control with the paddle shifters and the transmission’s convoluted software is less obvious, but the car still suffers from shudderingly slow shifts, leaving you totally unaware of whether a gear is engaged, causing the revs to flare if you apply throttle during the constant stream of shifts, then surging forward as a gear does eventually engage. It knocks your confidence in the car, never giving you any assurance that the 444bhp under your right foot is connected to the road or hidden away in the driveline. In its home market two other engines are also offered in the Mustang: a 3.7-litre V6 that serves as the entry-level model to the range, and a startling 5.2-litre ‘Voodoo’ V8 with a flat-plane crankshaft, as used in the Shelby GT350 and GT350R. It develops 526bhp. Ford’s new flagship GT500 model has also just been announced, packing over 700bhp from a supercharged version of the GT350’s 5.2-litre V8. Power is sent to the same Tremec seven-speed dual-clutch transmission as the Ford GT supercar. No manual transmission is available. If that still doesn’t sound powerful enough, then there are plenty of tuners who will help eke out much more power from the Mustang’s 5-litre V8. One of those firms is Sutton Bespoke, which offers a range of power upgrades from remaps to supercharger conversions. We’ve tested the CS700 and CS800, both supercharged and both put out a lot more power than standard; 690bhp and 825bhp respectively. 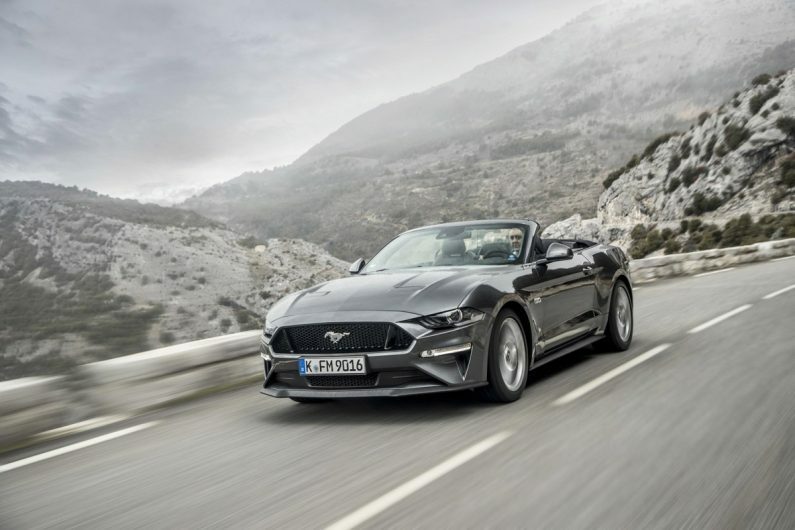 Despite significantly more power neither seems as phenomenally fast as their output might suggest, but the engine, chassis and visual upgrades do make the Mustang more desirable and give it real presence. If there is one undeniable fact about the Mustang, it’s that a small sporting coupe it is not. The Mustang is wide, long, and feels totally out of scale with most British driving roads. The Mustang has been on independent rear suspension for a while now, so it’s nothing like as unsophisticated as pony cars of old, but it’s still night and day to modern European coupes like a BMW 4-series. Not that the new Mustang is bad, of course. It’s just a very different experience to one that us Europeans might be used to, and there is a lot to be said for that. There’s a fluency to the car’s responses and a reasonably settled ride quality despite the relatively large 19-inch alloy wheels. It’s a fairly intuitive car to drive quickly, with a consistency and natural-feeling weight to the steering and a nice balance. Unfortunately, there’s little actual feedback through the steering, which means there’s some second-guessing when approaching the limits of the chassis. Recent experience with a Mustang equipped with a Koni Sport suspension set-up reveals only a little adjustment is needed to tease out the car’s potential though. With more body control and a lower ride height the ‘Stang is at once a little more planted and a little more exploitable, without destroying the decent ride quality. The EcoBoost removes some weight from over the nose (overall the car is 65kg lighter) which improves turn-in and reduces body roll. It’s not as adjustable on the throttle as the V8 though, and suffers the same damping limitations as its brawnier brother. The Mustang’s brakes are strong, but their responses leave something to be desired. Bite is almost instant and the pedal travel is quite short, making smooth, progressive braking more difficult than it should be. Wide spacing between brake and throttle pedals, and that grabby initial bite, also makes heel-and-toe downchanges difficult. Incidentally, it’s a problem not nearly as bad in the left-hand-drive car we drove most recently. Despite these issues, the Mustang is still a lot of fun. Drive it below its limits and stick to smoother tarmac and it becomes much easier to appreciate the car’s good balance and progressive responses – and in V8 GT form, the engine and manual transmission add a great deal to the experience too. The Shelby GT350 is equipped with Michelin Pilot Super Sport tyres, adaptive MagneRide dampers, a torsen limited-slip differential, and that 5.2 flat-plane crank V8. It is the most exciting Mustang you can buy, but the GT350 does lack any real feel at the front end. The large, 295-section front tyres mean that there is plenty of grip – you just can’t feel it. At seven-tenths the Shelby feels slightly cumbersome and aloof. You can’t tell if the tyres are keying into the road surface on the first application of lock, and you don’t have the confidence to get on the power early. Learn to trust the tyres however and launch the GT350 into bends and it starts to feel alive and more enjoyable – much more like the car you expect it to be. The braver you are with the Shelby, and start to throw the front into corners, you begin to feel the car move around beneath you. It’s extremely exciting, but a very physical experience. The more extreme GT350R uses the same 526bhp V8 and magnetorheological dampers as the regular Shelby, but to help its on-track behaviour it also has a new aluminium front hub, rear coil springs that have been wound in the opposite direction so that the two corners of the suspension are an exact mirror image of one another, thicker front and rear anti-roll bars, and rigid bushes. It’s also fitted with carbonfibre wheels shod in Michelin Pilot Sport Cup 2 tyres. The result is a dramatic transformation from the basic 5-litre Mustang GT. It’s sharp, very fast, balanced and, most surprising of all, incredibly grippy. Fuel economy is the 2.3 EcoBoost’s raison d’être. Whether you’ll consider the official 9.1L/100km combined figure (and accompanying 199g/km of CO2) a worthwhile trade-off to eschew the character of the larger V8 will be up to you and your bank manager, but it’s hardly a spectacular number. The V8, by way of comparison, manages 11.7L/100km combined and 277g/km of CO2. Fuel costs will therefore be higher, though experience with both engines leads us to believe there’s little difference in the real world. One upside to the new automatic is a gentle rise in L/100km figures for both engines, thanks to the incredibly long tenth gear, which will sit the Mustang at pretty much idle at 112kph. Driven hard, both will guzzle fuel at an impressive rate (we’ve seen single figures on track in the V8), but even the V8 can be persuaded into parsimony with a light foot – a gentle 112kph motorway run should see numbers around the 11.3L/100km mark. Tyres are likely to be the most regular expense. In standard specification you’ll be looking for 225/40 R19 rubber at the front and 275/40 R19 at the rear, making a pair of replacement Pirelli P Zeros $185 each on the front wheels and $240 each at the rear (both before fitting, from blackcircles.com). The Mustang’s muscle car persona is just as visible inside the Mustang, with the general dash architecture taking inspiration from Mustangs of the past. It’s not quite as commodious as you might think with its enormous exterior dimensions. Updates to the latest model are mostly of the tech variety, comprised of a new infotainment system and digital dial pack. The dials don’t have quite the same amount of variability in use as other digital dial packs, but the contoured, glossy screen and crisp graphics look great, while the personalisation options within are endlessly entertaining. Seats severely lack side support, and although comfortable for short periods, don’t offer much support for longer drives. Recaro seats are available as an option, which we would highly recommend. It’s a great cruiser, though. Cabin noise is fairly low – unless you’re really extending the engine – and there’s only a rustle of wind and tyre noise. It all feels very American in fact, but in the best way possible. Pity the view over the long bonnet is of a rainy, windswept rather than the Pacific Coast Highway. Even though it has had time now to become a familiar sight on roads, the Mustang still turns heads like few others, with a friendlier reaction than one might usually get in ‘normal’ sports and supercars as a bonus. Everyone loves the Mustang, and the latest aesthetic updates have just sharpened its aggressive, yet approachable good looks. One perfect example is from a sandwich shop nearby the our offices. Turn up in a Lamborghini, McLaren, Porsche, anything like that and the only feedback is whether we would like a can of coke with our order. Turn up in even a subtly specced silver Mustang convertible, and it’s the talk of the day. Uncanny. Previous ArticleDriver modes – do they offer genuine benefits? Next Article Porsche Cayman GTS vs Lotus Exige Sport 410 – which killer coupe will land the knockout punch?